Living in NY means being in contact with innumerable of people on a daily basis. In one subway car alone, you're stuffed in surrounded by people who are often coughing and sneezing (and who knows what else). This is the time of year when everyone at the office is sick, and the kids keep coming home with sniffles. I decided it was time to pull out the soothing wintertime teas. I like to drink tisanes with turmeric and ginger when the cold and flu season hits. I find turmeric, honey and ginger incredibly soothing for coughs, sniffles, and sore throats. Add in a bit of lemon, and it's even better. I recently created a recipe for fresh turmeric and ginger tea that is the perfect remedy for the wintertime blues. A few months ago a neighbor gave me a jar of a Korean tea concentrate that is essentially a thick concentrated paste of yuzu, ginger, and honey all mixed together. To prepare, you simply dissolve a few teaspoons in hot water. I love the ease of having this concentrate in the fridge. 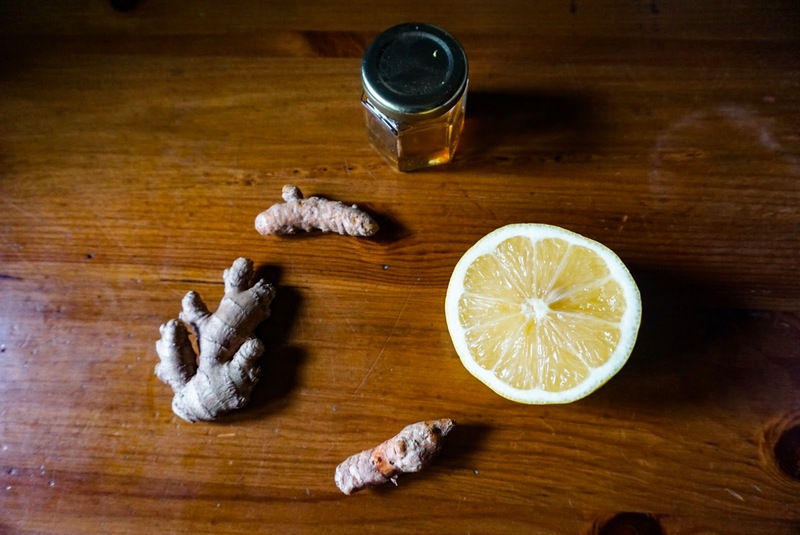 But the store-bought tea is a bit too sweet for me and it's not always easy to find in the store, so I thought I'd create my own version of zingy ginger tea and add a healthy dose of turmeric. Turmeric always seems like a good idea, especially during cold and flu season. Lemon too, for the added vitamin C. I love how the yuzu flavor tastes in the jarred version that I have, but yuzu is quite difficult to find and lemon is a great substitute. Fresh turmeric can also be tricky to find (I had to check a couple of stores before I found it), so you can substitute ground turmeric in the recipe if necessary. - If you're using fresh turmeric, be careful of staining! This stuff is potent. My fingernails were yellow for a couple of hours afterwards, even after vigorous hand washing. -I grated my ginger and turmeric by hand, which can be a bit of a pain. If you have a food processor or mini-chopper, use it! -I like to use raw honey in this preparation, it supposedly has more nutrients. But any honey will do. -You can absolutely use ground ginger and turmeric for this recipe, but you won't need as much. Fresh turmeric is difficult to find, and can be expensive, so please go ahead and use ground. I note the measurements in the recipe below. -You can thinly slice pieces of lemon and add it to this mixture, but I prefer just using the zest and juice. The white pith of the lemon isn't as pleasant to chew on, but it is edible. -To zest the lemon, I love using a microplane to get every last bit of zest, but a regular grater with tiny holes also works just fine. -This recipe makes enough for quite a few teaspoons of concentrated tea paste. I like to keep mine in a sanitized jar in the fridge, as it keeps for a couple of weeks. I hoard small jars after they've been used, exactly for this kind of purpose. My husband gets a bit annoyed with our cabinet overflowing with empty jars, but hey, they come in handy! Peel fresh turmeric and ginger before grating. 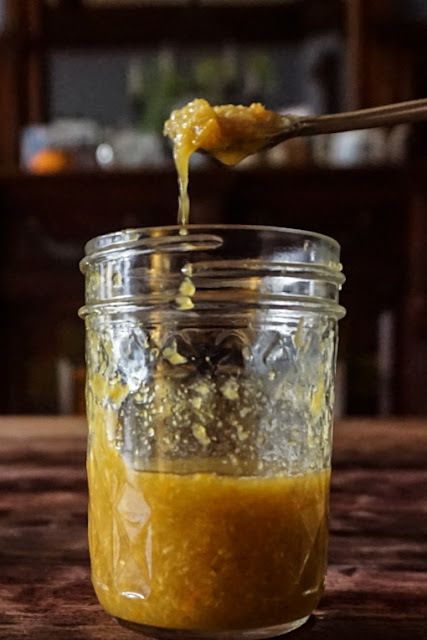 Once grated, combine all ingredients and mix thoroughly to create a marmalade-like paste. Add 1-2 teaspoons of the paste to a mug, and pour in hot water. Stir to dissolve. Add the remaining paste to a clean, small jar, it keeps in the fridge for about 2 weeks. Add as many teaspoons of this tasty mixture as you like to hot or cold water for tea. Too much ginger for your liking? You can use more water, and less paste. I also sometimes top up my mug with a bit more lemon juice if I'm feeling really under the weather. This is a versatile drink you can make hot or cold, but I love a steamy cup of this in the winter or any time I'm feeling sick. Even when I'm not feeling sniffly, I love keeping this tea in the fridge to enjoy on winter evenings. Just plop a few teaspoons in a mug and mix with hot water for a soothing, delicious warm hug. 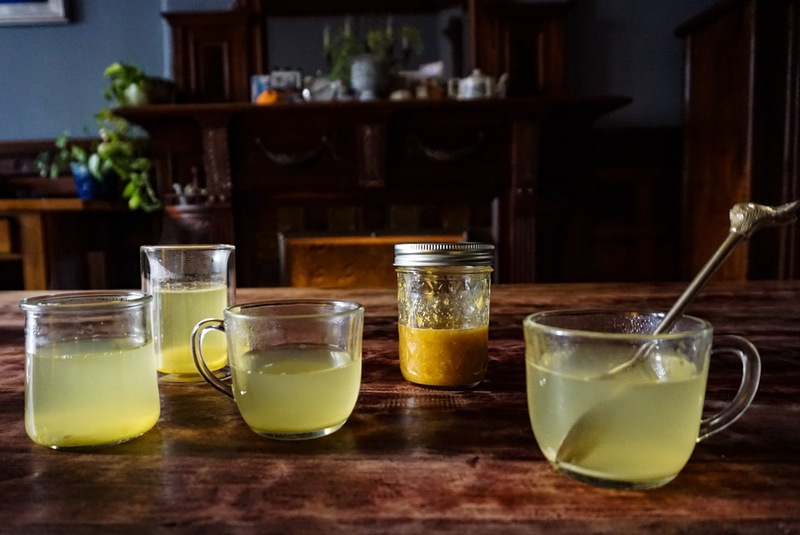 For a more authentic Korean yuzu citron tea, check out Jee's recipe at Oh How Civilized. 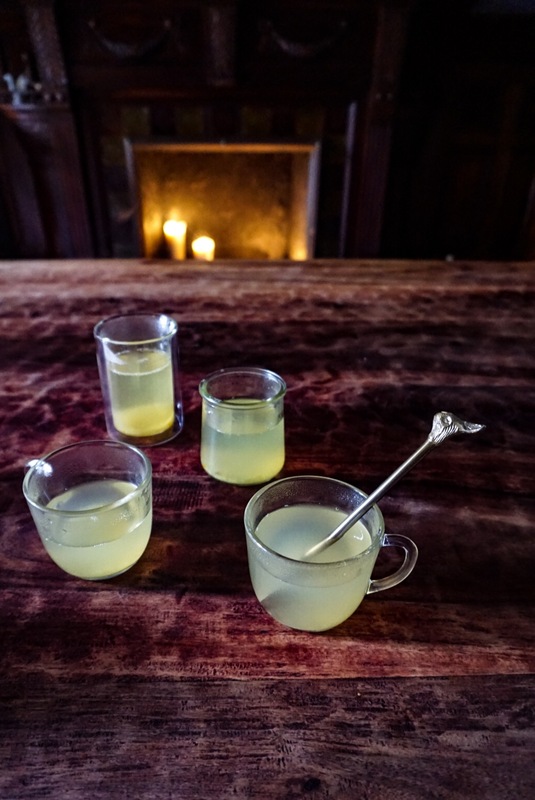 For something warming with a bit of booze, try my chai spiced hot toddy recipe. How are you staying healthy and warm this winter? Would love to know all of your hot tea remedies! Yum! Soothing drinks are lovely. I buy yuzu ginger tea from a Korean couple at the farmers market. When I have a cold, I drink it at night, with a shot of bourbon:) I sleep all night! The turmeric is a great addition, I bet, as it probably helps with any inflammation in the nasal passages, too. Thanks for the recipe! Thank you! ooh I love the idea of adding bourbon! I'll definitely be trying this soon :). Sorry for the delay in commenting, I've been having some issues with my comments!